We’d love your help. Let us know what’s wrong with this preview of His Father's Command by Justus A. Platt. Sir Arthur Gifford wants nothing more than to honor his beloved father by serving him as his helper on his Middle Eastern lands. But, one unexpected day, he is awakened to witness his father’s tragic death. In a plunge of life-changes, he is coroneted over the small, much-threatened lands. Meanwhile, Sir Arthur’s young squire Rufus struggles with his duties. He dreams of gr Sir Arthur Gifford wants nothing more than to honor his beloved father by serving him as his helper on his Middle Eastern lands. But, one unexpected day, he is awakened to witness his father’s tragic death. In a plunge of life-changes, he is coroneted over the small, much-threatened lands. Meanwhile, Sir Arthur’s young squire Rufus struggles with his duties. He dreams of great knightly acts, but fears on the battlefield burdens him with the dishonorable brand of a coward. His impetuous nature lands him into many grave troubles - some far beyond his strength to overcome. In the midst of the unrest, a wanted Lollard priest takes shelter in Giffordshire. His message to Sir Arthur is shocking - he cannot honor his dead father without the help of God. Is it true? And will Sir Arthur turn him over to the torturers as a heretic? To ask other readers questions about His Father's Command, please sign up. Packed with action, this debut novel from Justus A. Platt is sure to delight those with a bent for classical historical-fiction. Written in the fast-paced style of Henty, this tale of honor, duty, and newly-found faith in a sovereign God will encourage young readers and give them a new appreciation for the deeper facets of his-story. "Honorable men are Christian men." Debut novels are tricky. One seldom knows what to expect. 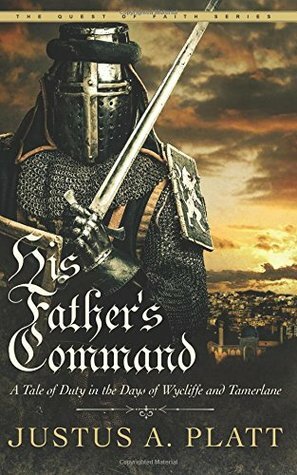 To my delight, His Father's Command was a delightful medieval tale, classically written and showing great attention to historical detail. Fashioned after Haggard's The Brethren and written in the style of Henty, there is little to convince readers that this book is not a classic. The premise of treachery, vicious assassins, Bedouins, and Middle Eastern lands was an interesting one. Sir Arthur's character as a determined leader and Rufus's as a frightened young squire were very well-portrayed, showing excellent character development. This book is for those who like fast-paced, time-elapsing novels. Many years are covered in this book, thereby showing the many disposition changes for Sir Arthur and Rufus. Many battles, plots, subplots, and intrigues are portrayed. Additionally, this book is not for the faint of heart! Battle tactics and the realities of war are depicted. My favorite aspect was the gospel message weaved creatively and powerfully through the story. I applaud Platt for this. Not many modern writers incorporate a full gospel message in their books. Additionally, Platt did a wonderful job of giving this important message without compromising history. Recommended for classical and historical-fiction readers. Also excellent for home-schoolers and medieval historians. This is not an easy review for me to write, but as is my policy, I feel absolute honesty requires it. Justus Platt himself is a lovely guy, and very courageous for setting out to write independently published books at a relatively young age. Good on him. At His Father’s Command could have been a great book. It really could, with the unusual setting- a fictional European Dukedom in late fourteenth century Turkey at the time of the rise of Tamerlane. It allowed for a mix of cultures and peoples wh This is not an easy review for me to write, but as is my policy, I feel absolute honesty requires it. Justus Platt himself is a lovely guy, and very courageous for setting out to write independently published books at a relatively young age. Good on him. At His Father’s Command could have been a great book. It really could, with the unusual setting- a fictional European Dukedom in late fourteenth century Turkey at the time of the rise of Tamerlane. It allowed for a mix of cultures and peoples which added to the story. However, there were certain aspects of the story that I just could not get on with. I can’t put my finger on it exactly, but I will try and explore it here. First, I did have some serious concerns about historical accuracy. At times, there seemed to be littlesense of period. I also got really peeved with the references to torture chambers in the first half of the book. Seriously, it’s like every villain had his own personal torture chamber- including the evil Bishop, which was conveniently located under the Cathedral. I'm not saying that torture never happened, bus as I’ve said before, ‘Medieval’ torture chambers are, by and large, a Victorian Myth- and from what modern historians are deducing, most of the instruments that we are used to seeing in them were invented for museums in that period. Other passages also did not ring true, like the hero’s Uncle wielding two ‘Chinese’ swords in the final battle scene, which I assume were meant to be Samurai swords. The villain wearing a modern Satanist emblem in the final scene was almost too much, especially seeing as he is meant to have been a close ally of Tamerlane. I think Muslims would have had serious qualms about allying themselves with a professing Devil Worshipper somehow. Moving on, some of the characterization left much to be desired. I have already mention the stereotypical evil Bishop. He had a few evil but cowardly Dominican Henchmen as well, who torture the virtuous Lollard Friar Stephen. Now don’t get me wrong, I understand the characters had to face difficulties, danger and persecution as part of the storyline. I also admire John Wycliffe, founder of the Lollard movement, and his aims - but I also like a little bit of realism, and though it may be controversial- I do not believe the depiction of all Medieval Clerics as evil and corrupt sadists is realistic. The author did however do a good job of presenting a nuanced view of inter-cultural relations between Christians and Muslims, however, with a good number of admirable and sympathetic Muslim characters. Also, whilst I have no objection to preachiness and a Gospel Message in books- there was something about the way the content was presented just felt forced, and didn't seem to fit the story at times.These passages read like something out of a nineteenth century evangelistic tract, with characters quoting lengthy passages of what was appeared to be the King James Bible in almost every challenging situation (although the copyright page says they come from the Wcyliffe Bible). Not that either is a bad thing, it’s just that it did not seem to sit well with the setting. They’d have fitted better in a book set in the American West, or eighteenth century Britain or some such. I admit that other authors have used the KJV before, its ‘old’ therefore, its used in books set in the fourteenth century. It should be stated here, however, that the New Testament John Wycliffe translated was not the King James- not was the in the basis of the KJV. It was a Middle English translation directly from the Latin Vulgate because he did not know Greek. Furthermore, Wycliffe was in fact an ordained priest, something which no modern Christian Fiction author I know of today mentions. I put that down to a deficiency in the sources, rather than any wilful ignorance on the part of authors. I would consider reading more by this author, but I believe other authors have pulled off Medieval Adventure stories in the Classical style better. I certainly would not suggest anyone avoid reading or buying this book and passing it on, it’s just a matter of personal taste really. Justus Platt is a home-school graduate and a passionate writer of historical literature. He hopes to obtain a degree in writing, which he desires to use for crafting God-glorifying, exciting books for young men. A book critic, amateur theologian, and trombonist, he and his family live in his native Arizona. The Quest of Faith Trilogy is his debut plunge into literature. “Sir Arthur stopped at the bottom of the hill and awaited the charging rider. The horseman halted in front of Sir Arthur and mud flew in all directions. “Who are you?” demanded Sir Arthur. He stared into the masked face and turbaned head of an assassin. Rufus's heart stopped. A gasp escaped his frozen lips and his legs wobbled.